Renown for the bustling weekly markets and local artisan flavour, Eumundi’s historical charm draws visitors and residents from far and wide. Little known, is that it’s also a town with not just one, but two converted residential churches. 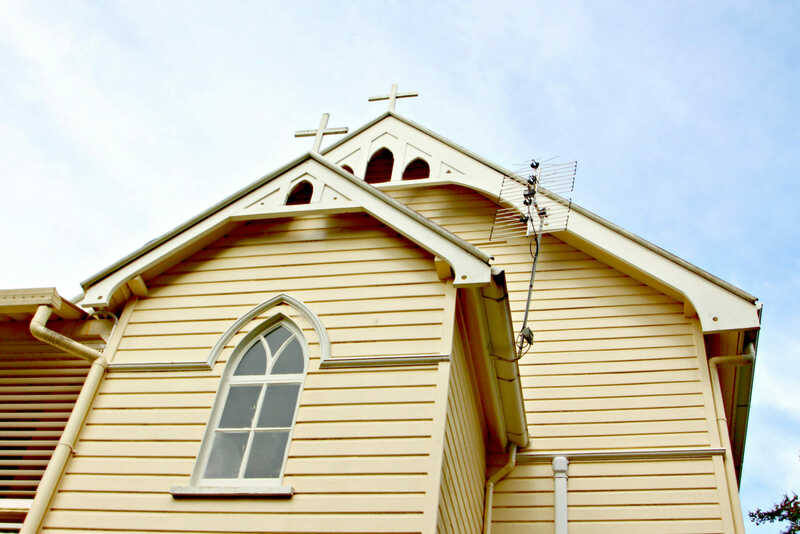 We sat down with Marlies Waddell who lives in the former Anglican church on Cook Street, to find out what life is like in her re-adapted heavenly haven. “I just love everything about the church. I love the windows—some of the windows still have the original glass—the tall ceiling, the type of timber that was used. It is a very sturdy building. The lead-light window at the front which is directly above my head when I sleep—there is a funny story about that because I did develop vertigo. When the ambulance came to take me to the hospital the driver said, ‘I’m not surprised you’re giddy—the whole room is orange,’ (from the window colour). Marlies hails from Geelong, she’s a mother of four, former Montessori school teacher’s assistant and If you’re lucky enough to live near her, she will cook you food, watch your kids and even bring you kindling on cold nights—I call her the Cook St fairy godmother. Thanks so much Marlies for being the world’s best neighbour and sitting down to talk with me.